Emperor penguins are very sociable creatures and live in colonies of anything from five hundred to twenty thousand pairs of penguins. It is very rare to find an emperor penguin living outside Antarctica. 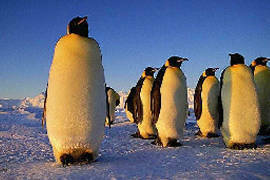 Unlike most species of birds the emperor penguin lays its eggs during the harsh Antarctic winter months of May or June. This is remarkable when one remembers that at that time of year temperatures may be as low as - 40 degrees Celsius, with winds of 90mph or more. These are, in fact, two of the reasons why emperor penguins do travel so far inland to reach breeding sites, called rookeries. Rookeries are usually situated at the base of permanent ice cliffs which offer some shelter from the freezing weather. The ice from these cliffs must not melt until the chicks are fully fledged which can take until the early summer months (November in the southern hemisphere). This is why emperor penguins will travel so far inland to breed. As soon as the egg is laid it is passed to the male who carefully balances it on his feet and then covers it with an abdominal fold of skin. Almost immediately then, the female leaves the male and joins other females from the colony as they make their way back to the sea to feed up. The males are simply left "holding the baby" for up to two months. Without the warmth and protection provided by the male's body and the insulation provided by the feet, the chick inside the egg would quickly die, and so the male penguin has to remain where he is until either the egg hatches or the female returns. Often the males will huddle in large groups for protection against the icy winds and storms. They have no means of obtaining food during this period and so they live on their resources of fat. Movement is limited to a few careful steps (with the egg still balanced on the feet). The female remains at sea for about seven or eight weeks before returning, well fed, to the colony. She is able to locate her mate despite the large number of now very emaciated males present and she then takes over the final stages of incubation. It is an amazing fact that if the chick hatches before the female returns the male is able to feed it by a process of regurgitation despite the fact that the penguin has not eaten for weeks. With the female safely back with the chick the male can now head (weakly) for the sea himself in order to feed heavily and put on the numerous pounds he has lost during the arduous period of incubation.